After days of being promised thunderstorms and rain it finally arrived and as usual just as school was coming out for the day. But oh how lovely it was. I was sitting in the car with all the windows down and the rain pelting in through those open windows and I did not care a jot about the wet upholstery. I was enjoying the rain, splashing in onto my arm and shoulder, soaking through my t-shirt and cooling me. It has been so unusually hot and steamy here in Melbourne that I was starting to wilt, along with the garden. It's been raining for about two hours and I swear the tomatoes are standing up taller and the pots at the front door are definitely a brighter shade of green. Of course, along with such a sudden deluge comes the flash flooding. The creek behind us has broken it's banks and the water is lapping at the walking path. It's not quite to our back fence. I don't think it will get there now, the rain seems to be easing. The local roads were flooded when I went to pick up Hannah after an emergency phone call. She was soaked but unharmed after a section of the roof at our local shopping centre collapsed and dumped a load of water on her. She was grinning from ear to ear, delighted to be so wet and cool without being in trouble! She doesn't have a scratch on her, just a little plaster in her hair and she was standing directly under the part of the ceiling that collapsed. 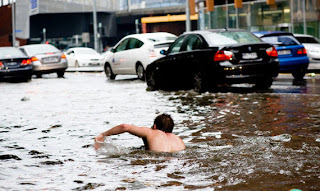 We heard on the car radio that people were swimming down Flinders Street! I can honestly say I've never in my life heard that one before. Driving home I noticed that the street lights were on and it was only 4.35pm on a February afternoon! Those storm clouds were dark, almost black. The air smells deliciously muddy, that combination of dust and rain and high humidity that reminds me so much of the tropics. I'm listening to the rain patter down on the verandah roof, it has such an interesting beat, staring off so softly and building to a major crescendo before coming to a sudden stop. No easing off for this rain storm, it just stopped. Looks like the storm has passed. We here in WA have had our 4th hottest summer (and fifth wettest) and are about to break a record of seven heatwaves. I'd certainly prefer to back in my childhood state but . . .